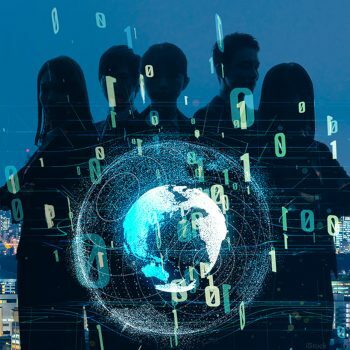 Strategic digital transformation is quickly moving beyond IT to lead a change impacting entire enterprises, compete, modernize how companies work and grow in the digital economy. Digital transformation is much more than a technical change; it is also a cultural and procedural change that organisations embrace. Digital Transformation has the potential to change how thousands of employees do their jobs, collaborate across the company, and make business decisions. Thus, digital transformation brings about a change in the entire organisation. Who are the people who bring about this change? Ownership of digital efforts is expanding to the C-suite and cross-functional groups that encapsulate a broad view of the organization. The owners of change include top leaders like CIOs who most often own or sponsor digital transformation efforts, and are increasingly transforming to business partners who facilitate change organization-wide and key digital investments. The CIOs are followed by CEOs in taking a more proactive role in digital transformation leadership. The CEOs are followed by boards (14%), chief digital officers (11), chief innovation officers (11%), CMOs (5%), and chief experience officers (5%) by order of proactive digital transformation adaptability. The leaders of change credit knowledge transfer as an essential tool that helps them manage digital transformation, close skill gaps, and reduce adoption risk. Knowledge transfer empowers employees to manage their own skill development and gives them access to the information, expertise, documentation and tools they need to become an expert on new systems. It empowers with the essential support they need to be successful at their jobs even when the company is changing around them. • Identify an expert to set the standard, who can train a team of people to be experts in the new system. • The next step is to create a skill development plan. Collaborate with the expert to identify the skills that the employees and trainees will need to develop to become proficient in the new application. After the skills development plan is set, break down each of these skills into teachable blocks that can be learnt within a timeframe. • In the process of knowledge transfer, trainees and apprentices are the principal knowledge receivers. As apprentices and trainees have the most to gain, it is essential to arm them with processes, tools, and goals to get to work in a way that works for them. • The final step is to test the transfer. To test, create a series of questions for each lesson for the trainees and apprentices. When they can answer each of the questions to the expert’s satisfaction, both the expert and the apprentice can be confident that the new skill has been acquired and the apprentice is now proficient in the new application. Digital transformation efforts are coming up short on the intended ROI partly because it is as much a leadership issue as it is a cultural, strategy, technology and talent issue. Some challenges that organizations face when taking the transformation journey include lack of funds, the need to replace legacy systems, cultural challenges like resistance to change and lack of people with the right skills. In order for digital transformation initiative to succeed, it is essential that the organization changes the way it does business. This can include getting employees reskilled, analysing processes and investing in infrastructure to clean up legacy IT systems. An organisation’s success into digital transformation depends on how its employees have embraced change management. Organisations must work together with employees to develop digital literacy, train and engage them around a digital transformation vision, to empower them and become partners in transformation efforts. In many organizations, data is fragmented, siloed and not monetised. Businesses must build centralized data infrastructures to support cross-functional efforts, in a bid to promote integration, collaboration and unify digital transformations around data-supported efforts. Organisations must not shy away from investing in data science, artificial intelligence (AI), and machine learning technologies. When an organisation implements digital transformation, it must audit the current levels of progress at strategic intervals to track the digital progress, and align its roadmap with those that are succeeding the change. Organizations hurry up to prioritize customer experience initiatives without studying their customer’s digital or mobile experiences. For a successful Digital Transformation, change leaders need to understand how customers’ intents, preferences and behaviours, are evolving to shape digital strategies. Once an organisation knows why it needs to change, it must determine how digital transformation will affect its business processes and must begin planning strategies to carry out the initiative, and must engage its employees towards the change. The key to digital transformation is achieving the highest levels of customer satisfaction with an increase in revenues. Once these are achieved, an organisation will be marching ahead of its competitors and setting up a change in the corporate arena.